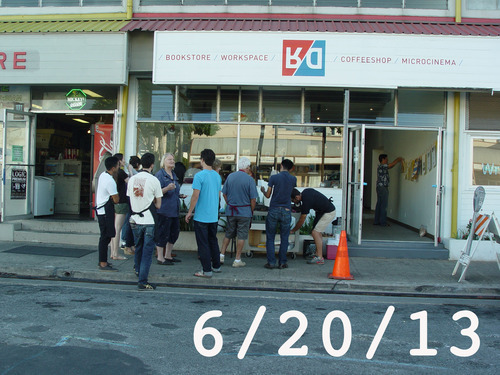 Every year, the Honolulu Printmakers hosts a large print sale, Impressions, the weekend after Thanksgiving. This year also features Impressions at Night, an evening event to end your Black Friday shopping with wine and art! 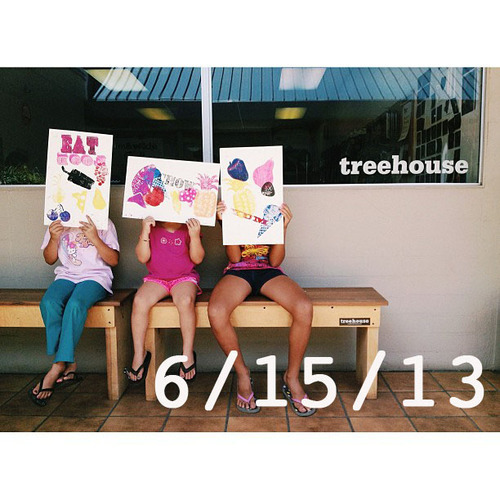 Impressions features fine art, notecards, frames, apparel, and other items that have been printed. In a relaxed setting and with friendly artists, this sale is the answer for people looking to avoid crowded malls and impersonal presents. 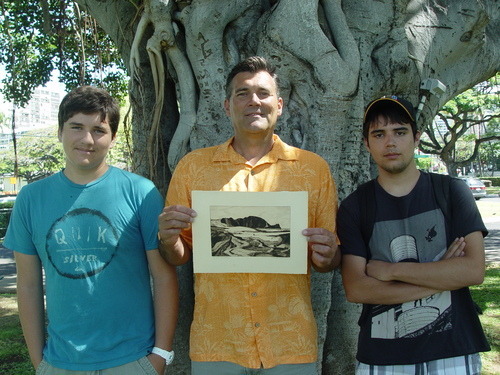 The Honolulu Printmakers had a busy summer. 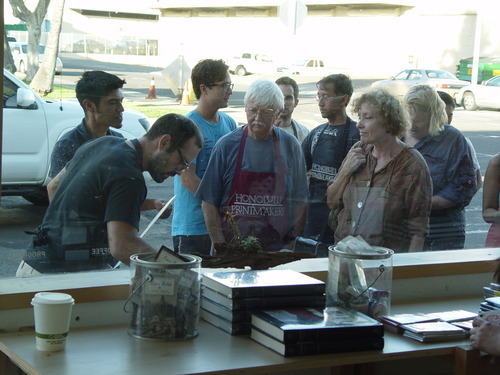 It was gratifying to see the studio so well used by new and returning members, and HMAS class students as well. 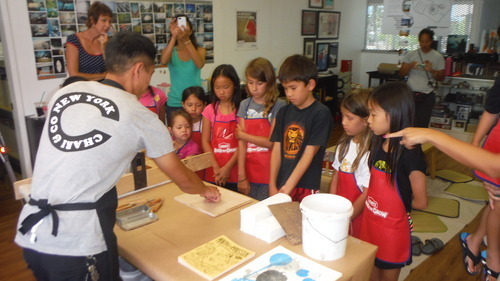 We continued our outreach activities through various printmaking demonstrations and mini-workshops held at The Honolulu Museum of Art School and at Treehouse. And we’re gearing up for an even busier fall season, so stay tuned for announcements of upcoming events and volunteer opportunities. Which reminds me, throughout all of our activities volunteers are the the crucial element that makes everything happen, and though they are too numerous to list here, I want to collectively thank all who continue to help in myriad ways. I also want to encourage anyone who is interested in getting more involved to contact me directly. 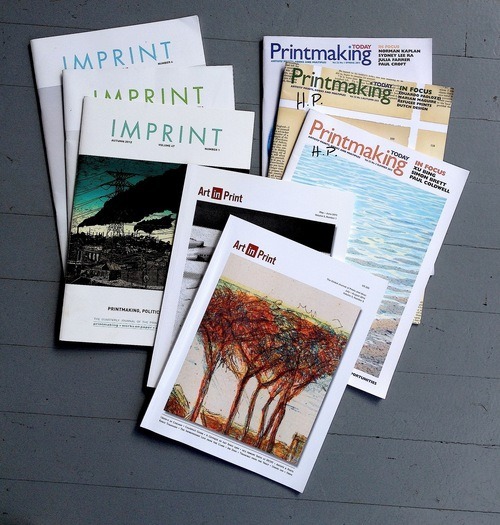 Don’t forget that we have a new fee structure for membership and studio use. I sent out detailed information on this via email, but if you have any questions please contact me. The feedback I’ve gotten has been overwhelmingly positive, but I have heard some concerns raised about affordability. 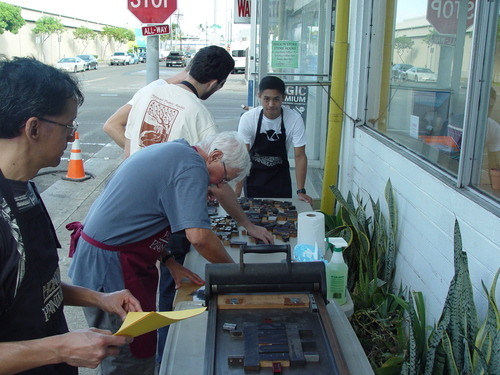 Please be assured that I am very sensitive to making sure everyone who wants to participate in Honolulu Printmakers is able to. Contact me with your concerns. 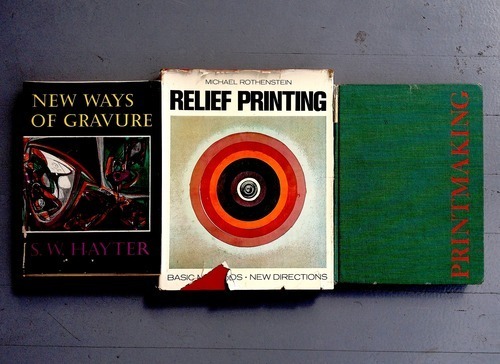 Our benefit print sale, Impressions, is coming up on Thanksgiving weekend. Start gathering your stuff together and keep a lookout for instructions on how to participate. I hope everyone knows about Laura Smith’s opening at Ektopia this sunday, 9/22 from 4-6pm. This is our new ferric chloride vertical etching tank, used for etching copper plates (the second photo shows a plate suspended in the mordant by a masking tape tail.). 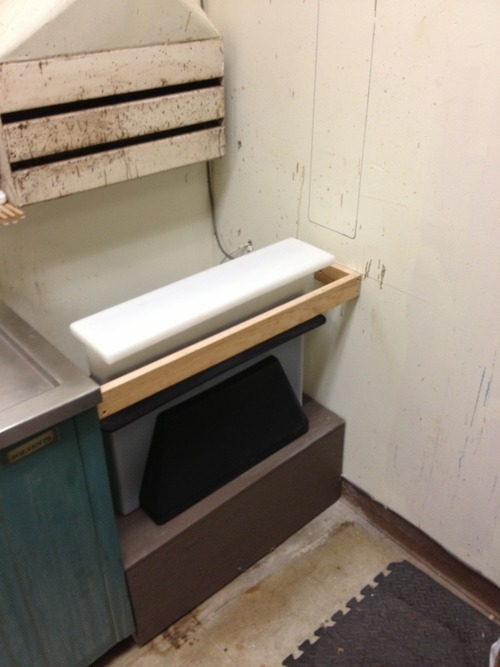 We are partnering with the HMAS printmaking department to promote the use of this safer etching system in our studio. 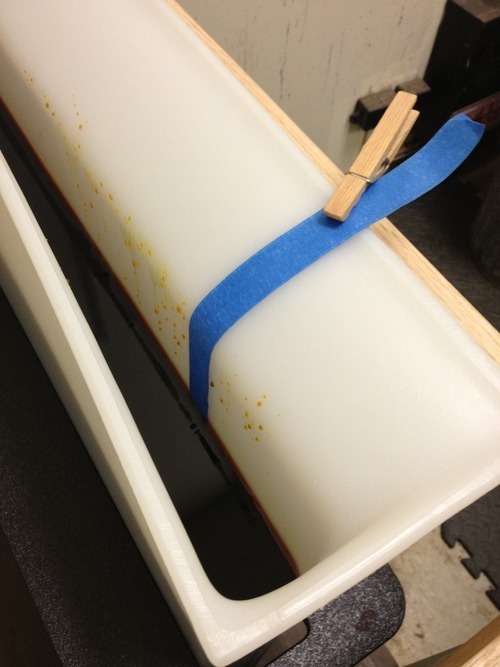 While not non-toxic, the use of ferric chloride for etching copper replaces other etching systems with significant health and safety issues, and is something of an “industry standard” in print studios around the world today. 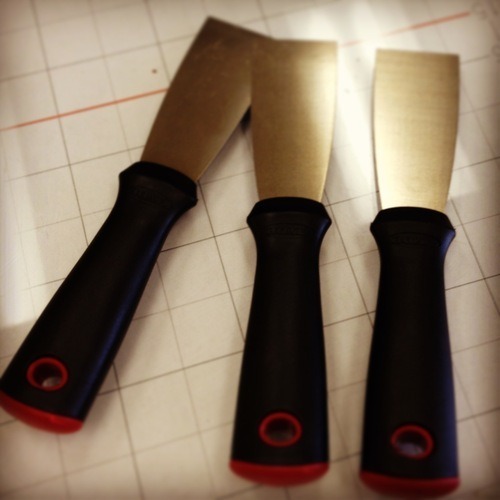 We will still support limited use of other metals, but copper/ferric chloride is our preferred system for etching now. Some of you may have used this system before, but for many it will be new. I can provide training to anyone interested in learning, as can certain studio monitors. Please contact me if you’d like to arrange a time to do this. I will also post a detailed blog entry about etching copper soon. A second tank will be added in the next few weeks to expand our capacity. That’s it for now. 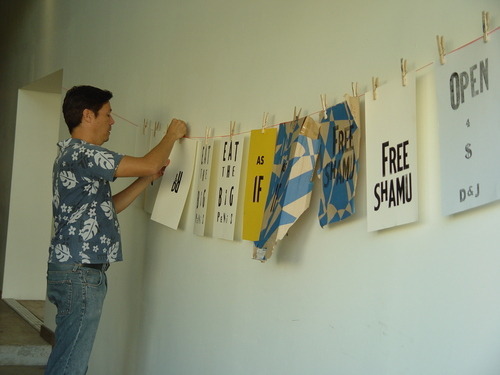 Keep printing! 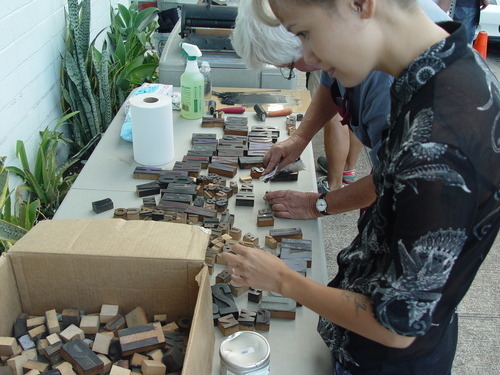 Laura Smith teaches the finer points of relief printmaking in-the-field, at Cyclovia in Kaka’aka on 5/12/13. 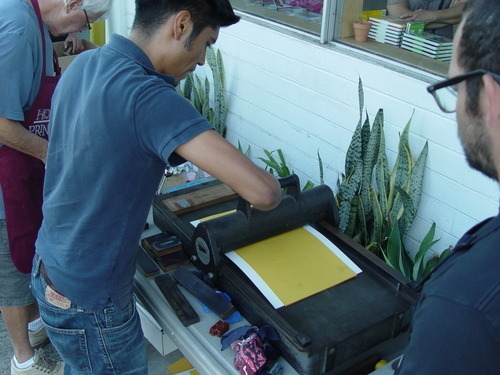 Joseph Nam, UH Manoa Printmaking student, presides over the ink slabs at a joint UH/HP relief print demo at Honolulu Night Market on 3/16/13.